The hotel’s central location made it a great base for exploring the city. The Pros: Excellent service and it’s a decent Club Carlson redemption. The Cons: It’s not the most luxurious property in the world, but works for a short stay. 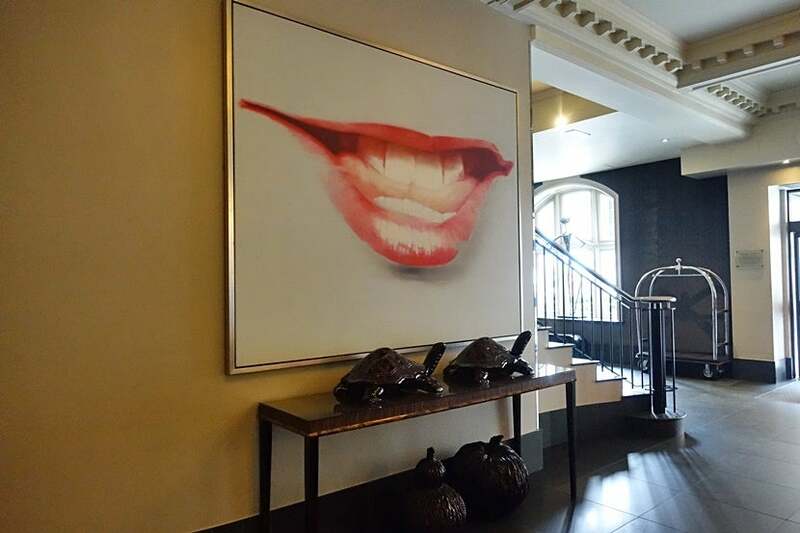 Club Carlson has a huge presence in London, with more than 12 Radisson Blu Edwardian hotels as well as the iconic Mayfair Hotel and several Park Plaza and Park Inn properties. London is also an excellent city to cash in your Club Carlson points because accommodations here are often expensive and paying with points can result in a greater value than you’d get in smaller cities. 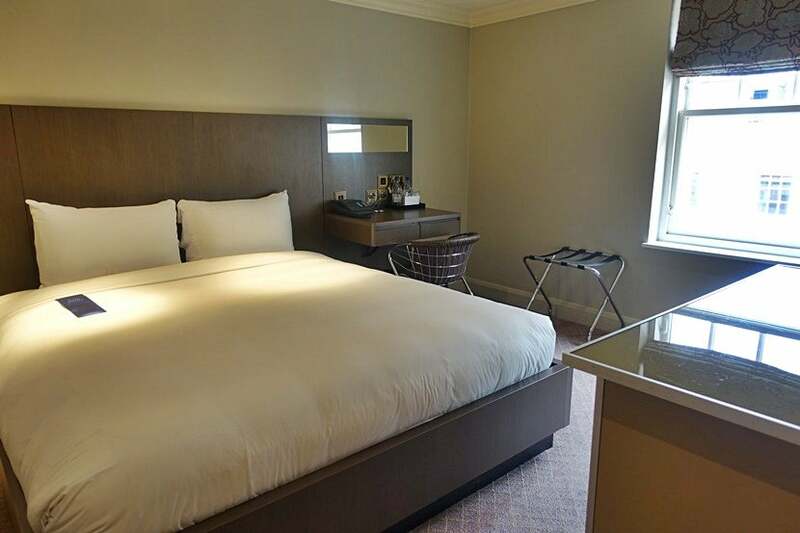 Here’s what it was like to stay at the Bloomsbury Street Hotel. 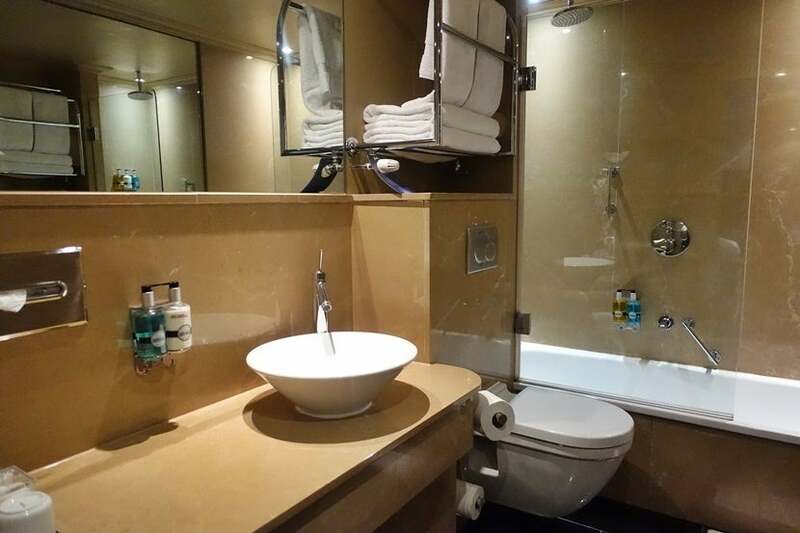 I chose to stay at this hotel because of its prime location near New Oxford Street and the Tottenham Court Road Tube station, and booked my two-night stay in a standard room through the Club Carlson website for 463 British pounds (~$660 at the time). Using a travel card like the Chase Sapphire Preferred allowed me to earn 2x points — or, in this case, 1,320 Ultimate Rewards points — for the travel purchase. Alternatively, paying with the Chase Sapphire Reserve Card would have let me earn 3x points for my stay. TPG values Club Carlson points at 0.4 cents per point, but using them in London can often result in a higher overall value, since prices are usually on the high side. For example, summertime bookings at the Mayfair Hotel can cost upwards of $570 or 70,000 Club Carlson points per night. While this is a lot of points, you are still coming out on top as you’re getting a value of 0.8 cents per point — double the amount TPG values them. 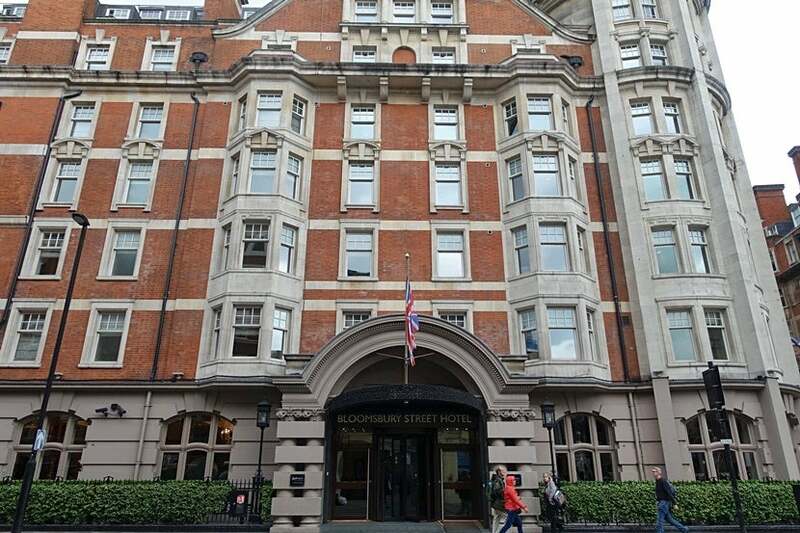 If you book the Radisson Blu Edwardian Bloomsbury Street in December, for example, rates start at $365 or 70,000 points per night, which would still give you a bit of an edge at 0.5 cents per point. Translation: Shop around, especially if you have flexible dates. 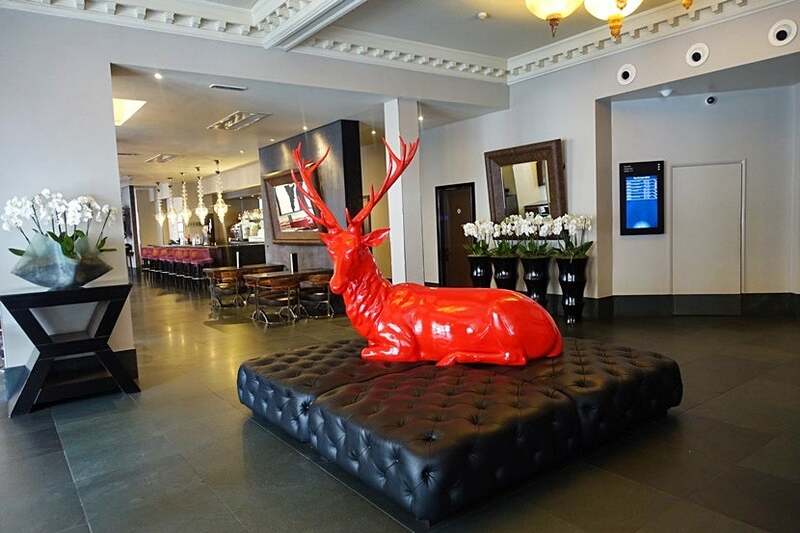 I was kindly welcomed at check-in by not only a friendly employee but also a giant, red reindeer statue perched in the lobby — quite a statement piece. 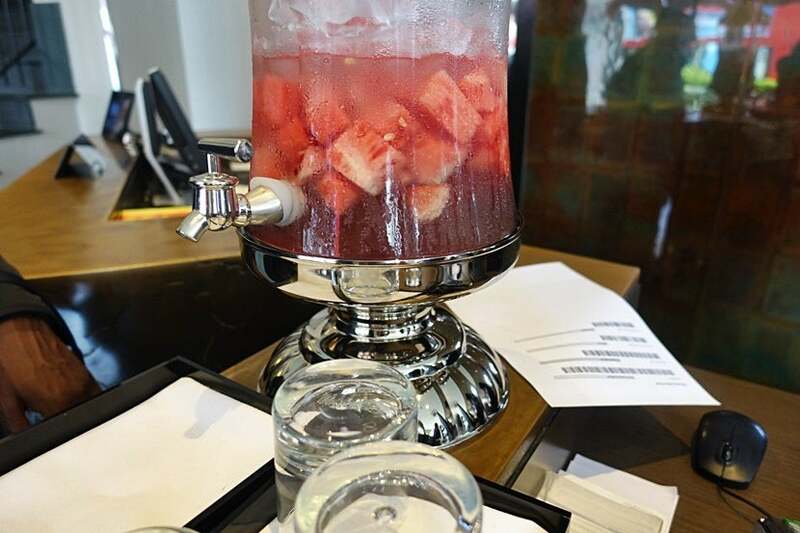 While enjoying a cold glass of watermelon-infused water, I asked for an upgrade and was told I could have a room with a king-size bed instead of the standard double bed set-up. My room wasn’t ready yet — to be fair, I had arrived around 2:15pm and check-in wasn’t until 3:00pm — but only had to wait five minutes before I was told it was. The lobby was small, but gave way to a bar and restaurant called Steak & Lobster. Still, the overall vibe was sleek and cool, and it wasn’t a bad place to enjoy a cocktail. The artwork was interesting, too, as you can see in the photo, below. 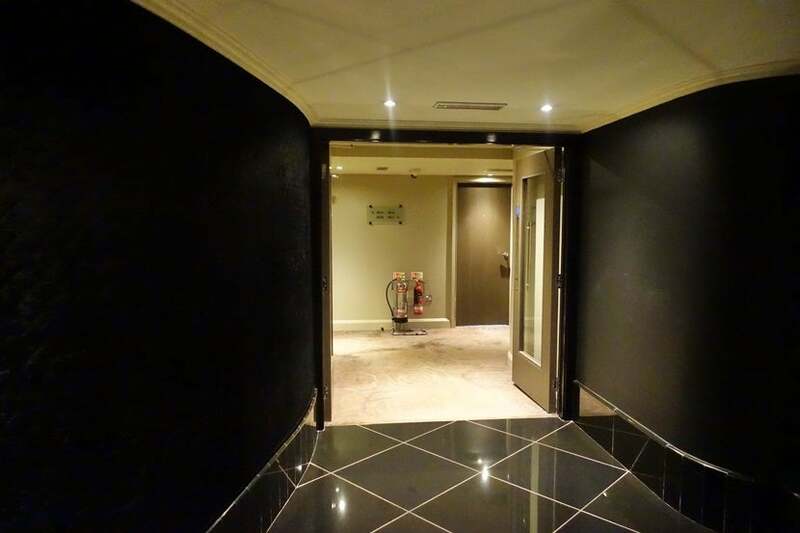 I headed up to the fourth floor and was impressed by the trendy black paint with Asian-style décor I saw upon exiting the elevators. As I headed down the hallway, I noticed it was completely different — ahem, not renovated — and covered in a light pink carpet with roses, a complete contrast to the modern-looking lobby. The room itself was simple, nondescript and decently sized for London standards. The king-size bed, as per my upgrade, was extremely comfortable. There was a bedside table one one side of it and a desk on the other, but only the desk side had power outlets. Thankfully, I wasn’t sharing the room with anyone this time around, but that’s one of my biggest pet peeves when traveling as a couple — in a double room, there should be plugs on both sides of the bed so each person can charge their devices. When are hotels going to figure out that it’s 2017 and power outlets are essential? Otherwise, while not being particularly stylish or fancy, the room was comfortable enough for my two-night stay. The room had one window that offered plenty of light — I could even crack it whenever I needed some fresh air. Once closed, the room was soundproof, which was great for getting a good night’s sleep. The closet had plenty of hangers and space to store my belongings. 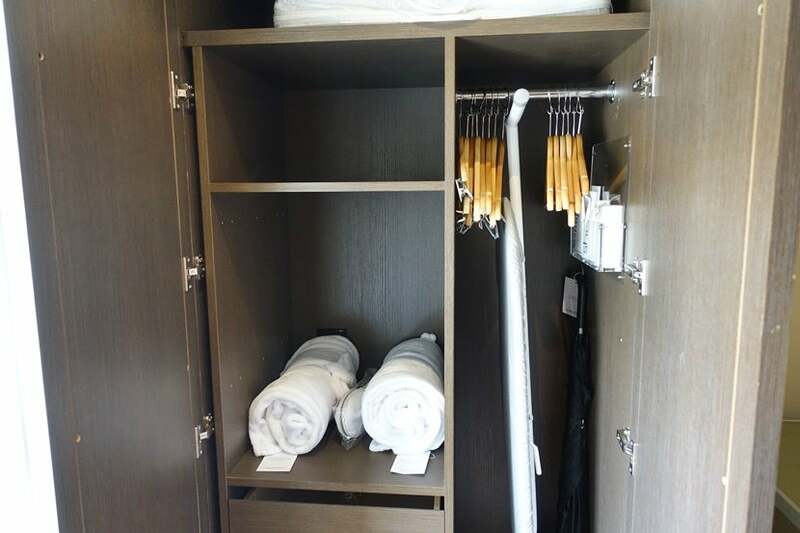 Two bathrobes, a set of slippers, an umbrella, an ironing board and an iron were also inside. 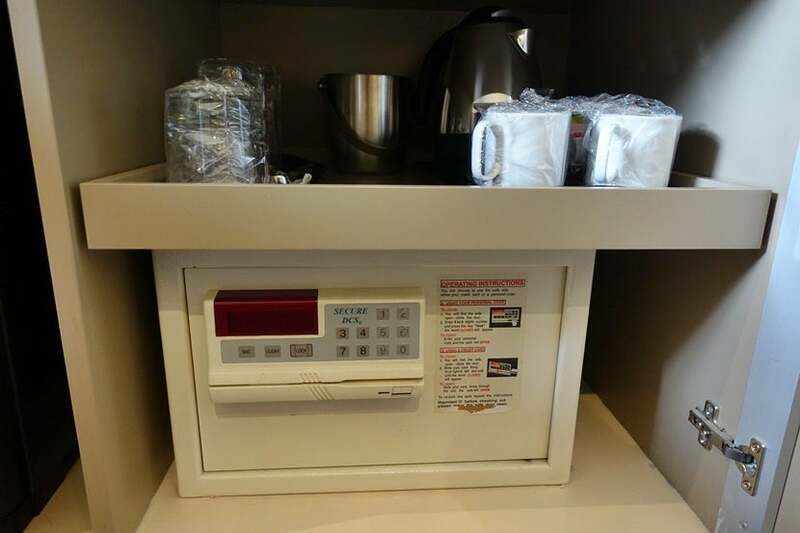 Underneath the flatscreen TV were a safe, a coffee maker and a mini-bar, complete with not only drinks but other items like a power converter, sleep kit and an intimacy kit. Two complimentary water bottles were also available per day. The bathroom was nice and spacious. Once I figured out where the light switch was — hint: it’s outside the bathroom next to the room light switches — I was able to check out the marble interior, too. The rainfall shower had the best water pressure I have ever experienced in a hotel shower. If you are someone who needs some serious water pressure, this one is heaven, although I don’t think it would officially pass the TPG shower test since it was a little on the shorter side. 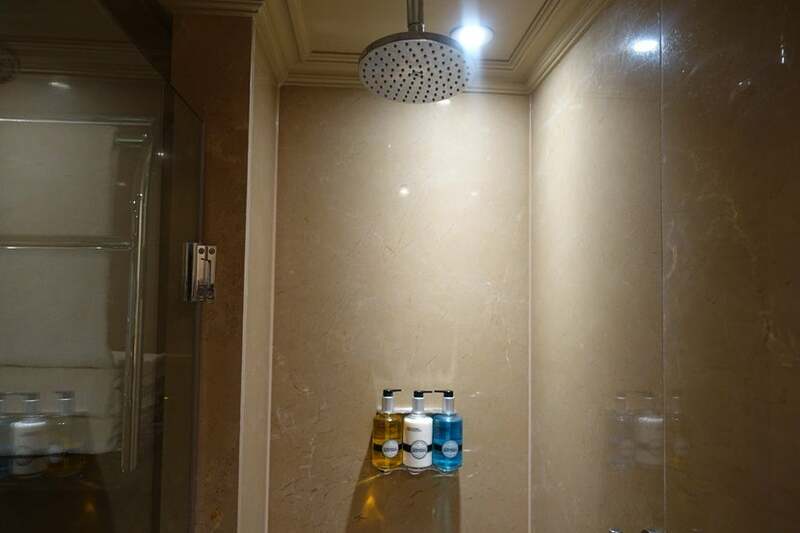 The Radisson Blu amenities came in large bottles that were installed in the shower. 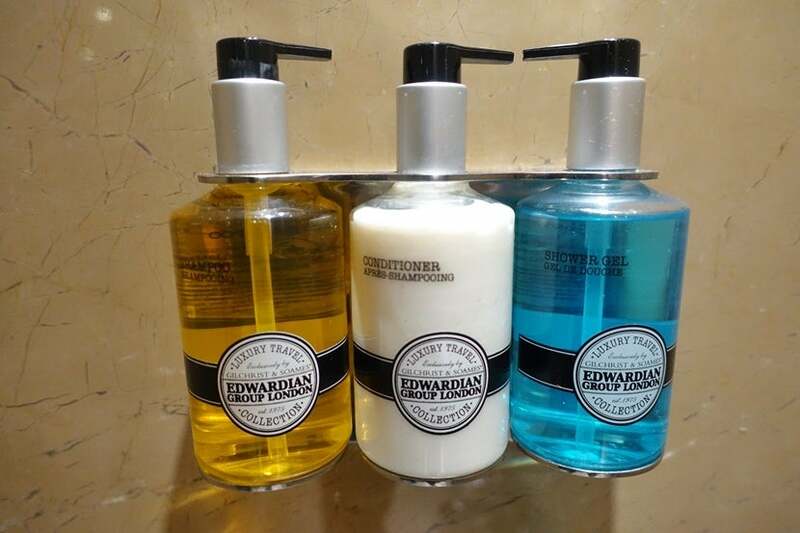 I only tried the shower gel, but they smelled pretty nice. 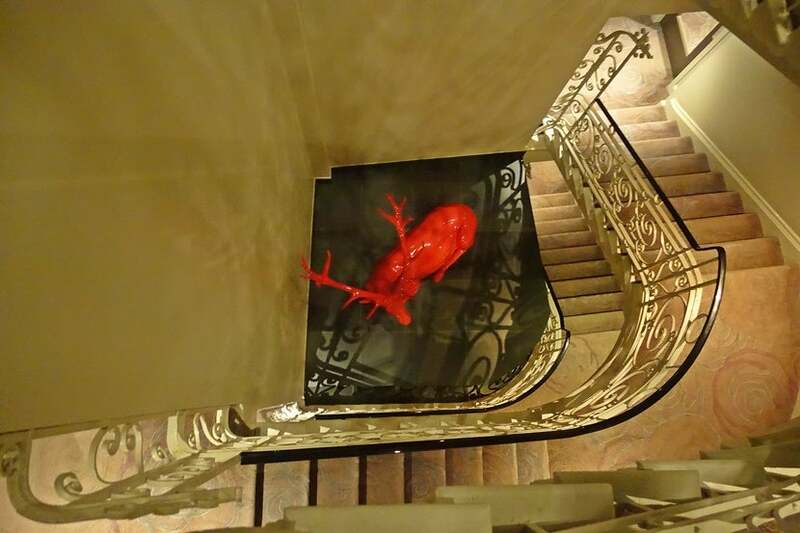 While the stairwell had the same dated pink carpet as the hallway, there was a nice surprise on one of the landings, as you can see in the photo, below. 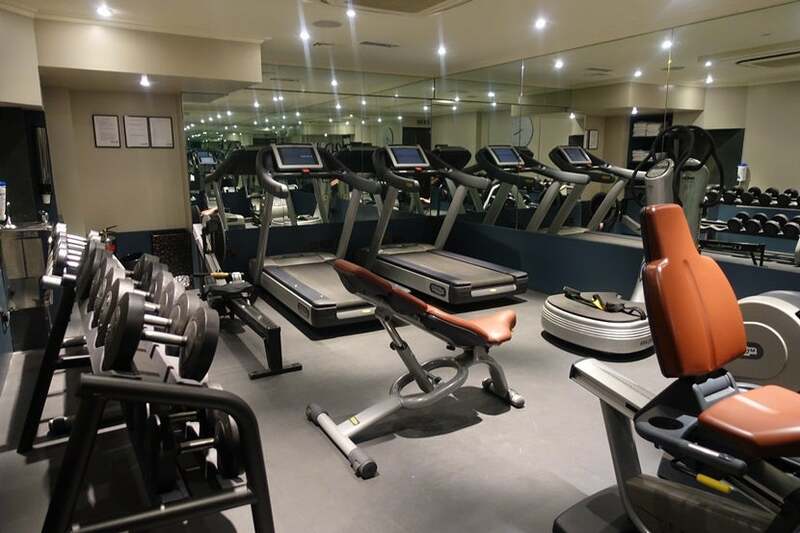 The hotel had a gym in the basement, which I popped into briefly. It was fairly well-equipped, though small and empty. Instead of working out, I helped myself to an apple and took this photo. Though the hotel does offer breakfast, it’ll cost you 21 British pounds (~$27) per person per day. I felt this was a rip-off and instead headed to the nearby Bloomsbury Café, where an English breakfast and coffee costs about 6 British pounds (~$8) and the Italian owners make you feel right at home. Meanwhile, the hotel’s Steak & Lobster restaurant is located next to the lobby, though I didn’t have time to eat there during my stay. Note that it may make a convenient place to stop by if you have theater tickets, as the hotel is close to most stage venues. As a London hotel, this one was fairly small and there weren’t many amenities, but I will say the staff and service here were excellent throughout. I had a small incident where I was in a rush to get to a meeting and the blow dryer had stopped working. I called down, and someone brought up a new one within three minutes. The hotel also offered complimentary Wi-Fi and it worked well on all my devices. 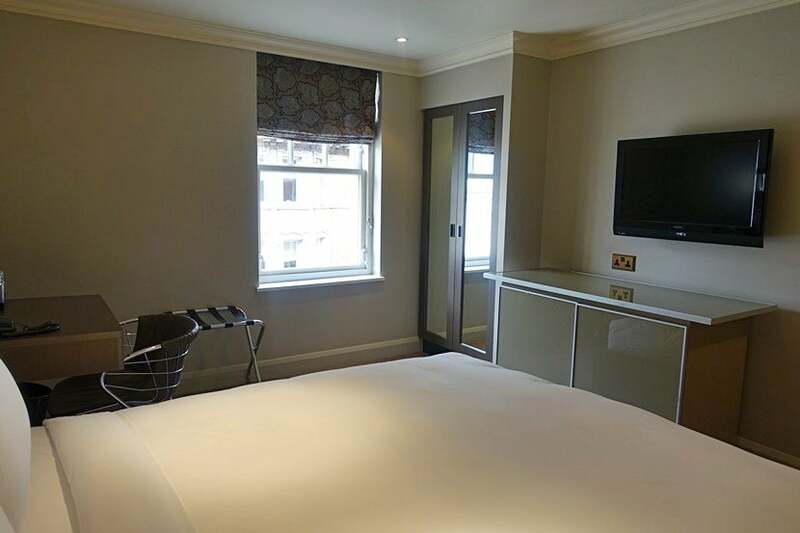 Overall, the Radisson Blu Edwardian Bloomsbury Street Hotel is comfortable and centrally located, making it a great place to stay for a few nights in London. It’s definitely not the most luxurious hotel in the city, but the price and quality are solid and the staff is welcoming. Plus, using your points at any of the Radisson Blu properties — or at any Club Carlson property — here could give you a great value, so check your options to see which hotel works best for you. 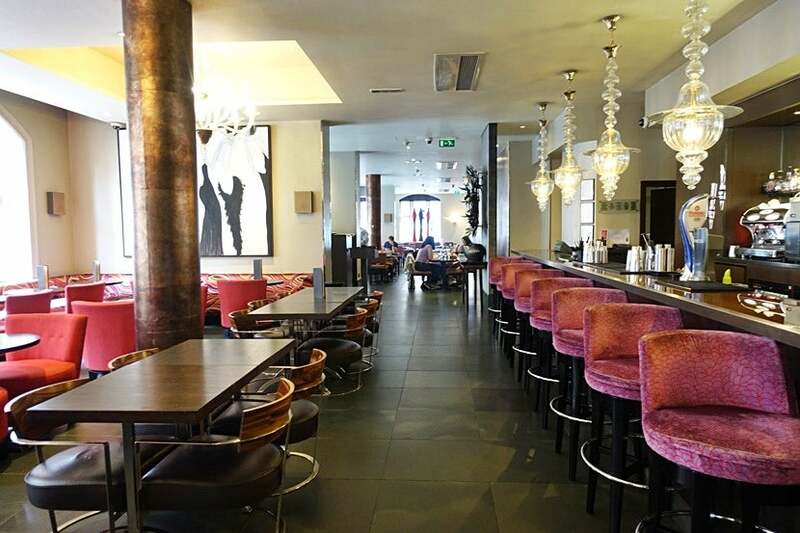 Have you ever stayed at the Radisson Blu Edwardian Bloomsbury Street? Tell us about your experience, below.